Claim up to $100 Stake Back with Dortmund vs Bayern Free Bet! Westfalenstadion will take center stage this weekend as Bundesliga’s biggest rivalry is set to get underway – insure your wager with Dortmund vs Bayern Free Bet! Make a bet on Der Klassiker this Saturday – back either side for the win – and if Robert Lewandowski outscores his former teammate Pierre-Emerick Aubameyang during 90 minutes of the fierce encounter, Intertops will reimburse your wager. Collect up to $100 Money Back with the Dortmund vs Bayern Free Bet Offer, if the Bayern’s No.9 bags more goals than BVB’s No.17. Use the following Bonus Code to claim the Dortmund vs Bayern Free Bet: WEEKLYSB. Note: both of the players must start the match, otherwise the Dortmund vs Bayern Free Bet Offer won’t count. Bayern Munich are the favourites to clinch an important victory over their rivals 1.95 (-105), however the fact that Dortmund will be playing in front of their home fans might usurp Die Roten’s plans. Thomas Tuchel’s men are underdogs 3.50 (+250) heading in to the German Clasico, considering their form in recent games – out of the last five games they’ve only clinched 1 victory, while the other games ended in 3 draws and 1 loss. A draw between the two stands at 3.50 (+250), and taking into account the derby will be played at the Westfalenstadion, it could very end in that scenario with a few strikes from each side. Place a wager on this match before this Saturday (November 19) and if Lewa outscores Auba in the match, you’ll receive up to $100 Money Back with the Dortmund vs Bayern Free Bet on Monday (November 21). Both Lewandowski and Aubameyang enjoyed their best-ever seasons last campaign (2015/16), as the former found the back of the net 30 times in the Bundesliga (42 overall), while the latter bagged an equally impressive 25 goals in the German top flight (39 overall). After only 10 rounds in the Bundesliga this season, both players have scored a combined 18 goals (28 overall), making them one of the most lethal forwards on the continent. That’s why it’s safe to use the Dortmund vs Bayern Free Bet, in case Lewa outshines Auba when he makes a visit to his former home this weekend. 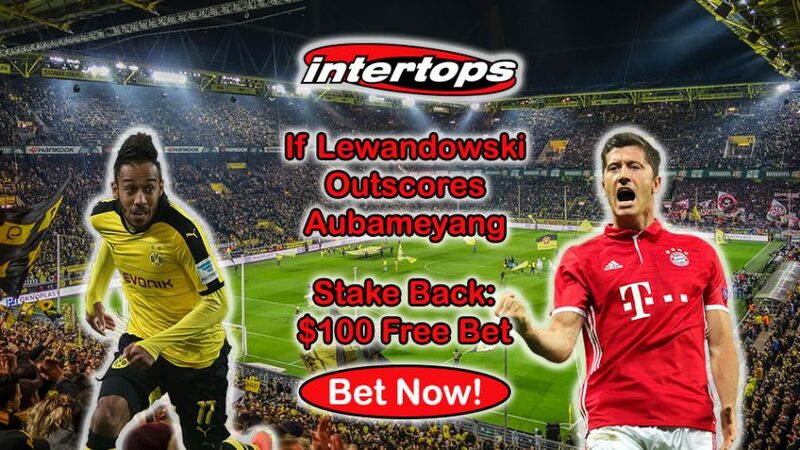 Join Intertops today and insure your wager with the Dortmund vs Bayern Free Bet Offer, in case Lewandowski scores more than Aubameyang. 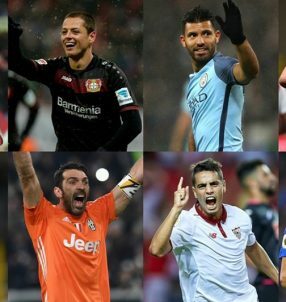 Claim $100 Money Back with Dortmund vs Bayern Free Bet!